For more information contact Una Voce Westchester. 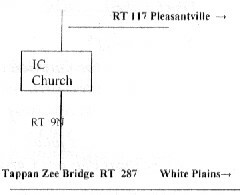 Immaculate Conception Church is located on North Broadway Route 9, north of the Tappan Zee Bridge and Tarrytown. Parking is available on-street, across from the Church of the Immaculate Conception at Sleepy Hollow High School, and in Patriots' Park on the blacktop roadway near the Church street.